Children growing up in impoverished neighborhoods are often exposed to all manner of trauma in their home lives and communities. Christel House South Africa recognized the stress students were experiencing – especially the gang violence in their neighborhoods. That’s why the school introduced Yoga classes for Grades R (kindergarten) to 7 twice weekly. Sue Roy, from Jumping Frogs Yoga, says children derive enormous benefits from the practice. Physically, it enhances their flexibility, strength, coordination and body awareness. In addition, concentration, calmness and relaxation improve. 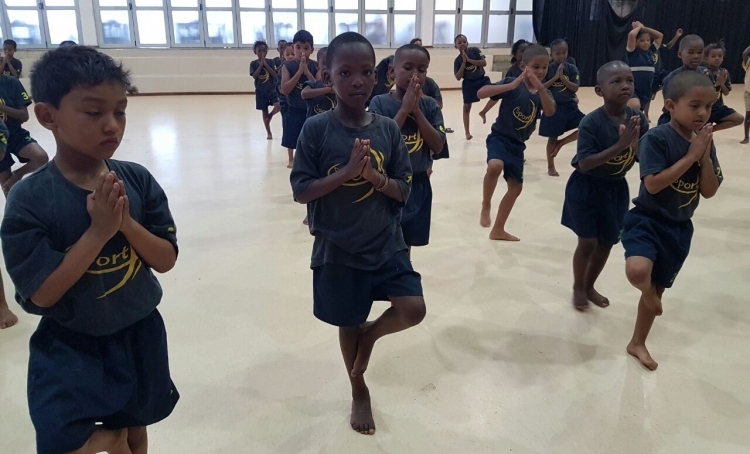 According to Sue, “When doing yoga, children exercise, play, connect more deeply with the inner self and develop an intimate relationship with the natural world that surrounds them.” CHSA feels it’s a program that can make a difference for a lifetime. And, teachers note they see positive changes in behavior after the sessions.